An air bubbler or aerator is generally the best choice for ponds and pocketbooks. They are economical to operate and are more reliable than deicers and heaters. Typically these systems have an onshore air compressor which pumps air through tubing to an air diffuser on the bottom of the pond. Many sizes and styles are designed for small water gardens up to large earthen ponds. The bubbling action is caused by the air rising to the surface which creates and maintains an opening during freezing temperatures. In cases of extreme cold, honeycomb shaped ice will form on the pond and due to its unique structure the gases will still be allowed to escape even though the pond appears frozen over. Because the compressor is onshore maintenance is made easier than fishing out equipment from a frozen pond. Bubblers and aeration systems can also be used year round. During the summer months they help increase oxygen levels and improve overall water quality. Deicers are small, floating heaters that work on the pond’s surface. Most units have an internal 100-300 watt heating element that provides just enough heat to keep a small portion of the surface thawed. This creates a small hole in the ice that allows toxic gases to escape the pond and help keep fish safe. Most units are thermostatically controlled meaning they only operate as needed to keep a hole open in freezing temperatures. A significant drawback to deicers is their electrical usage. At 100-300 watts of power deicers use more electricity than air bubblers in most cases. Some units can be as high as 1200 watts. Should a deicer experience failure the units are difficult to remove from the ice to be replaced. Heaters are similar to deicers. They also generate heat but they are primarily used to raise temperature of the entire pond to keep it from freezing. 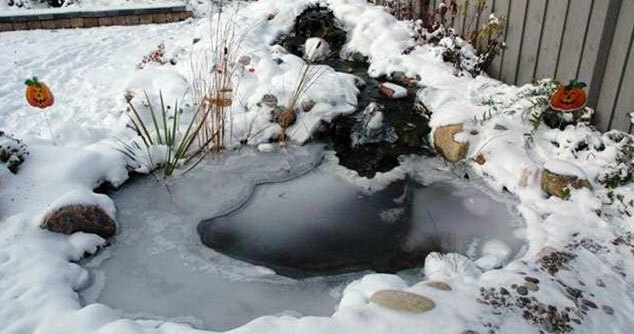 Pond owners who house their fish indoors or create structures over their pond may use a heater to keep water temperatures higher – sometimes as high as the 60°’s F. The heating element sits on the bottom of the tank to keep water temperatures high enough to prevent the fish’s metabolism from slowing too much. Choosing to put a heater outdoors in a pond during freezing temperatures can prove to be quite costly. Not only will the unit run continuously, but the fish will not have a chance to slow their metabolism. If the water cools unexpectedly this can cause significant harm to fish health. Monitoring proper working order of this type of equipment becomes very critical. All three types of equipment will work well when used correctly and in the right circumstances. By determining your needs you can select which product is right for you and keep your fish happy until the last snowflake falls. Interested in the products covered in this article?